At the start of the Ontario provincial election, which unofficially began when Doug Ford was narrowly chosen in March to lead the province’s Progressive Conservatives, most pundits and analysts predicted a two-horse race, pitting Ford against Liberal incumbent Kathleen Wynne. Many felt, based on the stark choice on display – combined with the Liberals seemingly poaching key NDP policy initiatives – that New Democrat Andrea Horwath would be starved of media coverage and political relevancy before ultimately being cut down by a strategic voting movement that would unite behind Wynne to stop Ford. Instead, Horwath’s NDP has momentum after first establishing itself firmly in second place ahead of the Liberals, and now by challenging Ford’s Conservatives for first place. Recent polls from Abacus Data, Maclean’s-Pollara, and Ipsos have placed the NDP and the Conservatives within a point of one another, both well ahead of Wynne’s Liberals, who sit as low as 18 per cent. And while other pollsters and aggregators like the CBC Poll Tracker see the Conservative lead as being slightly bigger, every major analyst agrees that the momentum is with Horwath and the NDP, while the Tories seem to be on a bit of a downward shift. In fact, two recent polls give Horwath a slight lead over Ford, brother of the late Toronto mayor, the infamous Rob Ford. There are two key questions here: First, what’s fueling the NDP’s momentum? And second, will it result in Horwath winning on June 7 to become only the second NDP premier in Ontario history to lead the province? 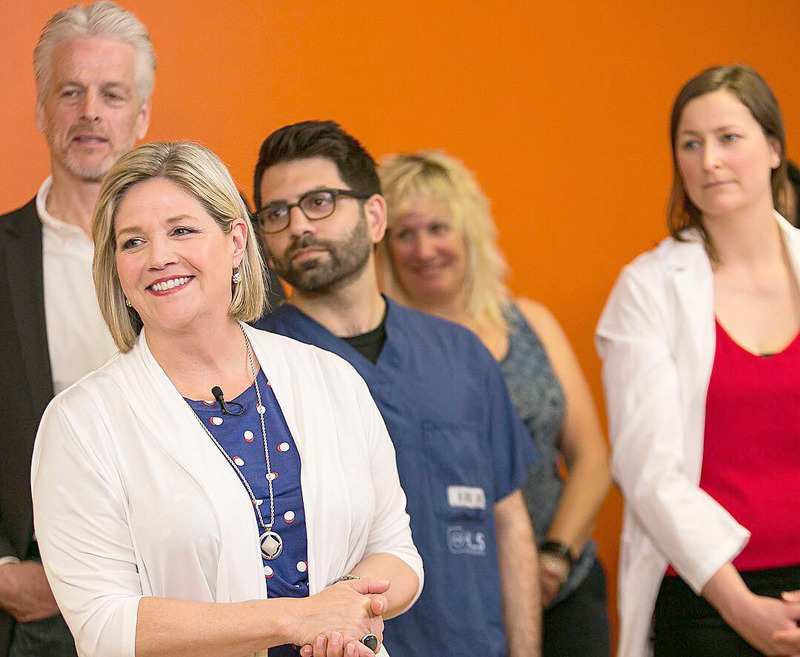 In broad terms, Horwath’s rise in the polls can be explained by three overarching issues. First is her general popularity, especially when compared to Ford and Wynne. This has been evident throughout the election, but some recent data shows that while Wynne and Ford both have negative popularity numbers (-47 and -20 respectively), Horwath enjoys a +29 rating that is increasing as more voters tune into the election. Conversely, Ford’s numbers are slipping as more voters become familiar with him. The second factor is the party’s platform, which is not only ambitious in its scope, but has been fully costed and vetted by former parliamentary budget officer Kevin Page. Conversely, neither the Liberals nor the Conservatives have released a platform, and while Wynne can claim that the recent Liberal budget is in effect the party’s platform, the Conservatives have offered scant details about what their specific objectives are. While they have recently promised a platform due a couple days before the election, there is no definitive sense for what a Ford government would do. Generally, the Tories have promised major tax cuts without cutting jobs and services by finding billions “in efficiencies.” This has led many people, including economist Mike Moffat, to suggest that it is likely Ford will create the largest deficits, whereas Horwath’s NDP, even after accounting for a recent $1.4 billion platform budget error, is the party most likely to run smaller deficits. It could therefore be the case that, for many fiscally prudent voters, the NDP is considered potentially better at minding the public purse than the tax-cutting Conservatives. This was followed up by an interesting moment in a debate on Northern Ontario issues in Parry Sound where a picture of the three leaders showed Ford and Wynne’s podiums filled with notes, while Horwath spoke without any. A minor factor to be sure, but that image helped to craft a narrative that Horwath spoke with passion and sincerity on the key issues, and not from a series of pre-baked talking points. But the real question, as noted above, is if Horwath and company can keep up the momentum for the next couple weeks and actually form a government. Right now, with recent polls painting the race as a dead heat between Horwath and Ford, the advantage still lies with the Conservatives. In fact, according to Global News, Ford could win a narrow majority government even after finishing in second place. This is for a host of reasons. First, Ford is doing very well among older voters, who tend to be more reliable in terms of getting to the polls. Second, the Conservatives have a more efficient distribution of voters, meaning that they have support spread across ridings, while the NDP’s support is more concentrated within certain ridings and regions. Third, the Ford Conservatives are very strong in both the GTA and what is known as the 905 – the heavily populated communities that surround Toronto. This is the province’s most seat-rich region, and it is powering the current Conservative lead. That’s why, according to seat simulators like Too Close to Call, the NDP would need to win by several points to win a plurality or majority of seats. This still doesn’t mean Horwath and the NDP can’t find a path to victory. If their momentum continues, even at a slower pace than we’ve seen, they may establish a statistically significant lead on Ford and company. Furthermore, the 407 data scandal – in which it’s alleged that upwards of 29 Conservative candidates used illegally obtained voter information to win riding nominations – is still percolating, and there are ongoing investigations by both law enforcement agencies and Elections Ontario. This could cause real trouble for Ford and push the Tories down in the polls. Just as interesting are the continuing effects of strategic and bandwagon voting. In the aforementioned Abacus data, they found that once voters saw that the NDP, and not the Liberals, were in second place, they accelerated their move from Wynne to Horwath. And given that voters pay more attention as election day approaches, this trend could continue. Again, the NDP likely needs to beat Ford by a few points to win the seat count, but if they can continue to pull in strategic Liberal supporters, and flip a few more soft Conservative voters, the New Democrats could easily build a more stable lead. Will that happen? Only the next couple weeks will tell. But one thing is nearly certain, in my view: On June 7, Ontario will have a new premier, and there is a decent chance it will be Andrea Horwath.